I am planning on buying a few things from Banggood for the first time and want to know how fast their priority direct mail is from the CN warehouse. I know it says 6-9 days under the name, but from experience with Hobbyking, the shipping time is rarely what they claim. Also how fast do they go from order placed to shipped. I am leaving for the Outer Banks on August 7th and would like to receive my package before then so I can bring the contents with me. Another option is to ship it directly to the house in the Outer Banks, but if the shipping is extra slow it could arrive after we leave and we will miss it entirely. I figure you guys have experience ordering from Banggood and know the procedure. Any other notes about the site is also appreciated. Thanks! My first order from them took a fairly... sedate 2 months to arrive, but I got confused and thought I was ordering from us.banggood.com -- which I found to be super fast and got product within 10 days. Typical shipping time from Banggood in my experience is 4-6 weeks. Most are closer to the 4 week mark. From the China warehouse mine usually take 2-4 weeks. From the US warehouse they take about 6-7 days as I think they promise. Thanks for the tips about the US warehouse mak and mark. I will look at some alternate sources and order from the US direct site if needed. Alright now I'm considering getting some DAL "indestructible" props from Surveillezone. Anyone know the service and shipping time there? I've also heard the DAL are less punchy and can hurt your motor/esc because they transfer the load in a crash. Thoughts? From the US store I get my orders 3-4 days after ordering. but from experience with Hobbyking, the shipping time is rarely what they claim. Well, it may not often be what they claim, but I ordered a telemetry radio set from the HK international warehouse (read: hong kong) last saturday using UPS saver. I wasnt expecting it for 2 weeks or so, I was in no rush. 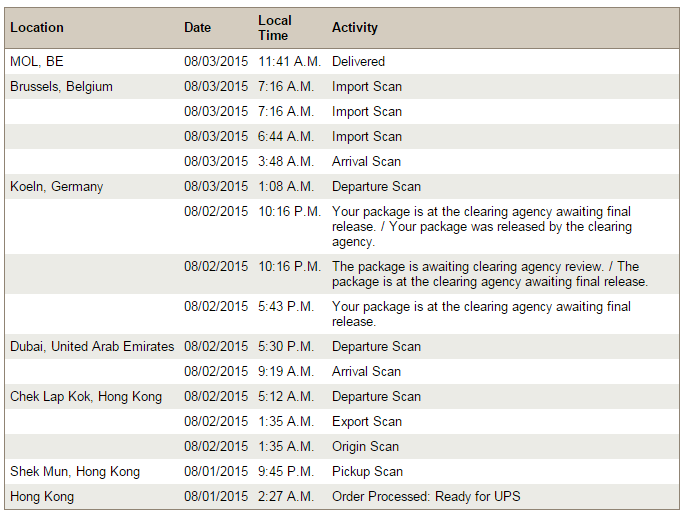 It takes longer than that if I order something in the EU warehouse, which is ~1 hour driving from where I live lol. I have been ordered to UK and I get my orders in 1 week after ordering, there free shipping services is really great.